"Mona Rainville" of the house of RAINVILLE had nothing to do with the naming of the good ship USS RENVILLE APA-227. Counties in Minnesota and North Dakota. Renville (APA-227) was laid down 19 August 1944 as MCV hull 673 by Kaiser Co., Vancouver, Wash., launched 25 October 1944, sponsored by Mrs. Orpha Penderville; and commissioned 15 November 1944, Capt. William W. Ball in command. Following shakedown out of San Diego, Renville sailed in January 1945 for Guadalcanal, where in March she embarked 1,620 combat-ready troops for the invasion of Okinawa. Her assault boats transported the troops to the beach at Okinawa 1 April. Departing on the 5th, she steamed via Saipan and Pearl Harbor to San Francisco. During the remainder of the war, she transported troops and supplies between various Pacific Islands and the United States. In September, she carried 1,436 Allied prisoners of war from Japan to Manila. In 1946 she returned additional troops to the United States, and then operated along the Pacific coast. Operating in the western Pacific, she was ordered to Batavia, Java, in December 1947. Renville became Headquarters ship for the U.N. Truce Commission that negotiated settlement terms between Dutch military forces and Indonesian nationalists. The ensuing agreement was denoted "The Renville Truce." After operating off the west coast from May 1948 to January 1949, she voyaged to China later in January, and returned 8 February. Decommissioned 30 June 1949 at Mare Island, Calif. she recommissioned 5 January 1952 for service in the Korean War. Departing San Francisco for the western Pacific 13 November 1952, she shuttled troops between Japan and Korean ports such as Pusan and Inchon. After June 1953, she steamed to San Diego. After duty at Eniwetok from January to June 1958, she operated in the western Pacific from October 1958 to March 1959. In May 1959 she joined a landing exercise at Camp Pendleton. On WestPac tour from October 1959 to April 1960, she was station ship at Hong Kong in January and February, and participated in a joint landing exercise at Taiwan in March. Again in the Far East from April to 5 December 1961, she sailed to Okinawa, Subic Bay, Hong Kong, Taiwan, and Yokosuka. Following west coast duties in early 1962, she headed for the Caribbean 27 October 1962 in response to the Cuban Missile Crisis, returning to San Diego 13 December. Deployed to WestPac from December 1962 to May 1963, she ended 1963 in west coast operations. After a landing exercise at Camp Pendleton, Calif., in March 1965, her WestPac tour of May to August took her to Hawaii, Okinawa, Da Nang, Qui Nhon, Sasebo, and Yokosuka. After local duty, she began her WestPac tour of March 1966 to October, carrying marines to Okinawa and Chu Lai, Vietnam, before serving as station ship at Da Nang in August and September. In 1967 she prepared for deactivation. Transferred to Maritime Administration 23 April 1968, she joined the National Defense Reserve Fleet, Suisun Bay, Calif., where she remained into 1973. Renville received one battle star for World War II service, two for Korea, and four for Vietnam. Provides information to assist personnel affected by nuclear testing in obtaining government recognition, health care and financial assistance. The Cold War was hot for men like Robert Campbell and Earl Lee. Radioactive hot. Yahoo! reviewed these sites and found them related to US Veterans > Atomic Veterans. Dave Stewart sent email about his duty at Operation Hardtack. I was on the USS Renville during the Operation Hardtack Phase. I was a welder on the ship and it was my responsibility to install a sprinkler system on the weather side of the ship. After some of the bomb explosions we turned they system on and went steaming through the explosion area. We did get exposed to some radiation but I know of no one that had their radiation tags change color, at that time. I have been checked a few times for ill effects of the experience but nothing has been found. My health is good, even at 64. We were close enough to one of the blasts for the shock wave, traveling through the water, to break one of our main water lines inside the ship. Many of us did get the "skin burn" from the flash but it was minor. It was quite an experience. Funny how we all seemed to trust the government. I don't now, I realize the system if full of liars. Bill Kishbaugh sent email about his duty at Operation Hardtack. I served as an Engineman on the USS Renville APA227 from July 1955 to June 1959. 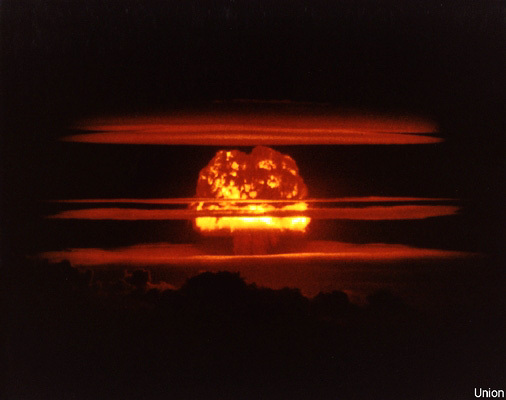 I participated in Operation Hardtack off Eniwetok during the April-May 1958 Atomic tests. I recall witnessing several tests ranging from bombs to rocket detonations. As I recall, when the first bomb was tested, there were a number of abandoned target ships and vessels anchored in the test zone. We were told that "volunteers" would be selected to go on a work party to scrub the exposed ships down after the tests to see how much radiation could be removed by that method. Fortunately we were never called. I recall sitting on the deck of the ship's fantail with my back to the blast and bracing myself against a 5" gun tub for the anticipated concussion. I remember closing and covering our eyes during the initial detonation and then opening them. It was the most intense light I had ever seen. As I recall, there were no shadows or dark areas due to the intense light. Once during the middle of the night the General Quarters Alarm was sounded. A voice came over the ships loudspeakers " Atomic Attack - Atomic Attack, This is no drill. " It was repeated several times. The first thing I thought was that the Russians were attacking us, as it was during the Cold War period. Many sailors went topside to man their battle stations and it had been raining. It turned out that radioactive rain had fallen during the night and when it was detected the OD sounded General Quarters. One problem was that the men who had been topside tracked the radioactive rain below decks. Confusion seemed to reign. The men were ordered to report to the fantail and throw their radioactive shoes overboard. The order was soon rescinded so I never threw my shoes overboard. I was in charge of the ships fresh water distilling plants. I recall a fellow named William Kirchner working for me. I was instructed to monitor the incoming sea water, the discharged brine and the fresh water for radiation levels and was told what the safe range should be. The salt and solids removed from the sea water was called "Brine" and it contained higher levels of radiation because radiation attaches itself to solids. The evaporators or distillation plants were operated with steam and were in an enclosed space located well below decks. The heat was intense, as the ventilation air being drawn in from topside was already hot due to outside temperatures. We had a shower rigged up and stood watch in underwear. Every few minutes we would stand under the shower to cool off with the radioactive water. I lost a lot of weight during that trip due to the heat. So far I have not been diagnosed with any form of cancer. I think that I have had a loss of tooth enamel resulting in the loss of teeth. My tooth decay has been far in excess of what my siblings have experienced. Otherwise I have not had any known adverse affects from radiation exposure. Forrest Bahler sent email about his duty at Operation Hardtack. Hello! Atomic Veterans...my name is Forrest Bahler, member NAAV, Operation Hardtack 1 in the spring of 1958 under Task Group 7.3 by Rear Admiral David M. Tyree, USN Commander. I was a deck hand, 3rd Division, USS Renville APA 227 troop transport stationed at Des Base, San Diego, Ca. Our ship was rigged with wash-down apparatus throughout topside. We set sail for the Marshall Islands (I forget the exact dates). The first test was an aerial test in the latter part of April 1958...then I think, it was Japtan Island (home port?) of the Marshalls...no cameras or any photo equipment could be used by anyone. I witnessed around (12) tests altogether...underwater...surface...and one aerial test AT FIRST! During the underwater test, I had duty down below at the aft steering. I was wearing headphones and only reported to and received from the con. Leaning against the bulkhead waiting for anything when a shockwave hit and I sailed over the steering apparatus...headphones were tore off, my left ear was ripped and bleeding down my neck. I was wrapped around everything you can imagine. From what I heard, is that the con was trying to get in touch with me...how did I know? No phones. I gathered myself up and at that time, the messenger of the deck came down as I was looking for my headphones...blood running down my neck from my left ear. Finally, I was released from my station only to know of two things...my situation and the shockwave also split a big gash in one of the seams amid ship. I am not going to go through each detonation but a couple or three...this one shot 6,000 yards from ground zero...rocked alot...what a shockwave! I was sitting on the 5" in the trainers seat and got knocked clear off of it...others were picking themselves up and learned later that the shockwave also broke the horizontal communication wires...actually, it broke the glass insulators! There was the other shot (surface) that was about the same...I was really scared on this one...more than the first...I'd say we were standing on the fantail with our backs to ground zero...approximately six miles from ground zero. The con ordered our backs to ground zero and to place our hands over our eyes...we did...and waited and waited. I peeked with my left eye. I saw every bone in my left hand as I opened it. I stared in shock and disbelief...I saw every bone...every joint and my flesh was a very pale, pale pink...like an x-ray in mild color...I was so scared, so frightened. My heart pounded so hard for so long...I was so weak and broke out in sweats as I still do today. About a half hour later, I felt the fantail whipping back and forth. The ship was making a fast-getaway to starboard...we noted the mushroom aloft had shifted due to the winds and it was over the top of us. A few particles dropped and we out ran it and then washed down...buckets and swabs and soap...and, of course, our trusty film badget 1.25" wide x 2.25" long...as I can remember. After R&R at Japtan Island, green beer, pineapple juice and a rope-guarded swimming pool...sort of...no one would swim in for fear of radiation exposure. We went for the next shot and the same as usual...except for seeing three cull ships that sunk after this surface test. After getting slapped around from the shockwave and the countdown for when we could remove our hands (seeing nothing), I didn't look at my hand on this one...scared of going blind! Three cull ships...probably destroyer escorts or destroyers...first ship...one mile from ground zero...next ship two miles from ground zero and the next, three miles. The first ship was straight up (as it appeared to me) tilted back some, came down and kept on going...second ship went up and came down, bobbed once and down she went. Third ship was up and came down retaining its floating position. The scientist or whatever dressed up in a large white suit was able to get on her for (17) minutes and she went down. How do I know? He came to our ship to test for radiation and told us he would have liked to have more time to take more tests but she (third ship) was sinking and had to get off. We finally left Eniwetok, tearfully...so happy! I'd seen enough...felt enough and feared for my future and for my family...'cause I had heard so much about this radiation while there. I remember when we left Eniwetok, the Captain in a message to all of us said...this tour could take 20 years off our lives...I promise you he said that. We came home...so much to tell...so much to be scared of and so much to be thankful for...all rolled into one. There is so much more, fellas...I just don't have anymore left I'd care to report. So I have so much to thank Keith Whittle, Richard Conant for as I know the rest of you do the same. I have two certificates...a big one and a small one (10"x12") that says...Greetings! Ha! They are our peers and I sure appreciate them...oh yes! Did I hear someone mention someone's name...was it Pat Broudy? Hi, Pat!!! From a letter received October 10, 2000. In addition to my written experiences to Keith and our new National Commander Richard V. Connant - How fortunate we are to have these two men!! And also Melanie Smith, Tahana, Whitecrow Foundation, so much thanks to her, bless her!!! I should have headlined my deposition as "The Nuclear Holocaust of Military Personell - From Trinity to the Clean Up of it all in 1962." The DOD started out using military personell and then went to using animals. They used rabbits strapped down, pigs and whatever else - But the DOD had to quit this because of cruel and in human treatment to animals. So what did they do? DOD used military personall, straped down to a ship that was full of military personel from the Captain on down. The tests in all killed many men from nuclear fallout which the DOD still doesn't want to admit. There radiation film badges were useless, as we all know. Our intake was so severe- many sicknesses were caused from radiation exposure. Neurological problems, stomach, intestinal, that later caused cancer of all areas of the body. I was discharged shortly after Operation Hardtack, 2 months I quess. One morning I awoke - had to go to the bathroom - passed alot of blood. This lasted 7 - 8 years off and on. Went to doctors time and again - but after all the tests. Not really an answer. But then again all these nuclear tests were controlled tests. By whose definition? DOD? Someone said something about a medal? Why not each and every Guinea Pig receive the Bronze Star?? For Bravery, for facing the unknown. For our bodies being saturated from fallout, fighting this enemy of fallout for all our lives. For those of us that lived and suffered from disease throughout our lives with so many, many lives being cut short, because of a radiation soaked body!! And the DOD with no mercy even on guinea pigs, they had mercy on animals and quit - but used us. What would be wrong with the Expedition Medal? There should not be any argument of either, now should there? In addition, I remember while in Wetok, just before we left to come home , while everyone was topside, who ever it was , came and took our bedding (blankets ) and issued us new blankets. I wonder who might do this ? Never did find out. Would it be that our blankets were being tested for radiation ? Makes one wonder now doesn't it ? What about the medal being turned down again ?Now isn't that just something. But I suppose that those in the pentagon would be able to slap one on their lapel we might be considerd for one !!!!!! Atomic veterans have not recieved any recognition for our sacrifices, none what so ever !!!!!!!! Our contributions as guinea pigs for our government has not revealed a thing!!!!!!! WE gave selfless service , we have all risked our lives and well being, forever.